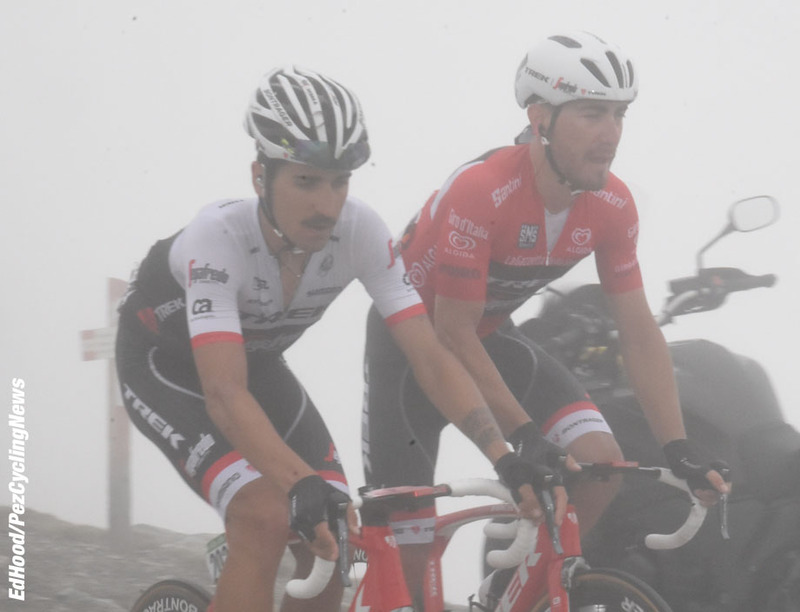 We'd gambled on a big attack by Chaves at high altitude, today. 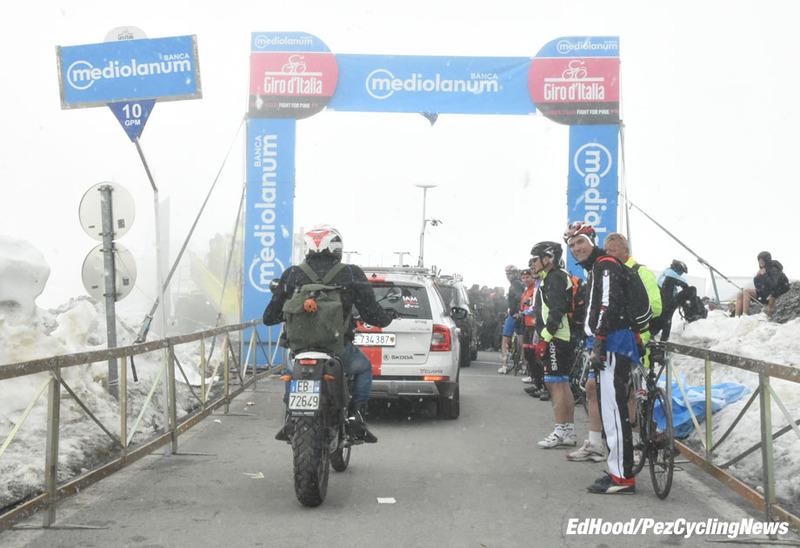 It didn't come and yet again, Kruijswijk looked strong as a beast within 1500 metres of the Giro's highest point - the 2744 metre Colle Dell'Agnello. 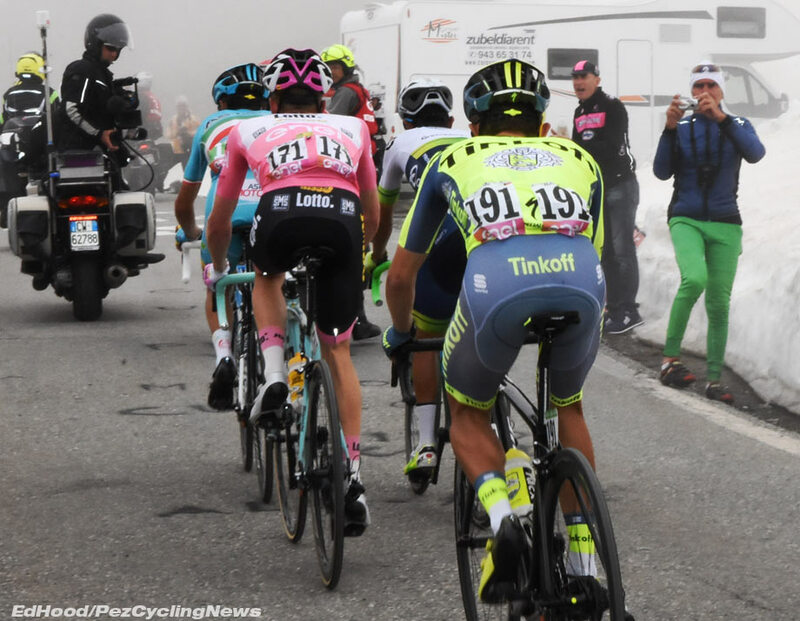 Little did we know that minutes after the maglia rosa passed us he'd crash on the descent and the race would be turned on its head. 'Hi !' We smile at the guy in the bed & breakfast. He stares a hostile stare at us. 'Reservation' we say, smiling optimistically. To cut a long story short he'd double booked us and we had to follow him on a magical mystery tour to his friend's place some 10 kilometres away. There's a 'but' in the three metres of snow which are up there - it's been cleared but in situations like this, where there are high snow banks and nowhere to park the Organisation sometimes only allows bicycles and race traffic over. Us 'stampas' get diverted - usually on some long, boring, featureless road. Once we clear Pinerolo there are long, flat straights aplenty but that's not going to last. The road starts to rise at Piasco, not steep but the trend is certainly upwards. 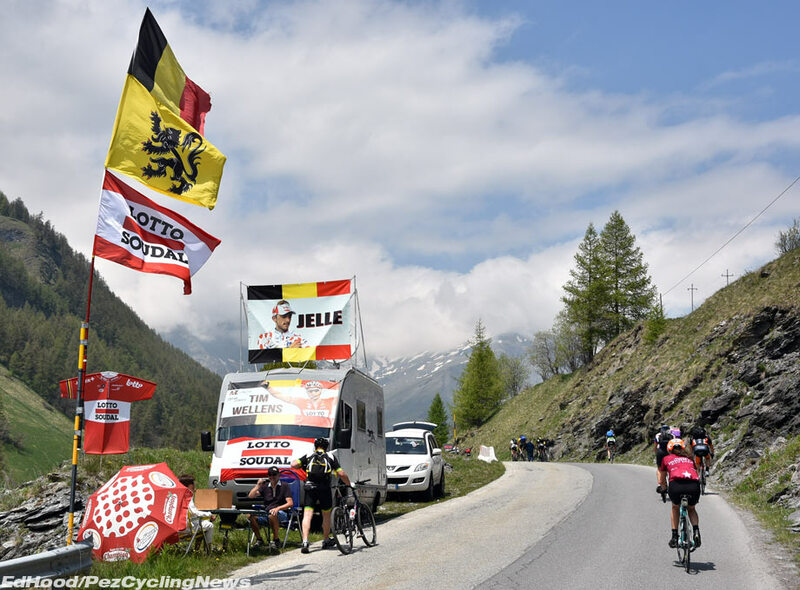 It's well surfaced and rises through meadows and forest - tappa half distance and the valley sides are closing in as we pass cyclist after cyclist grinding upwards to watch the race as high up the Col as their legs will allow. The first four tornantes have a sprinkling of fans and immediately after that it steepens up to Casteldelfino where we catch our first sight of snow. Out of the village we pass the 75 K marker and the grade is serious. 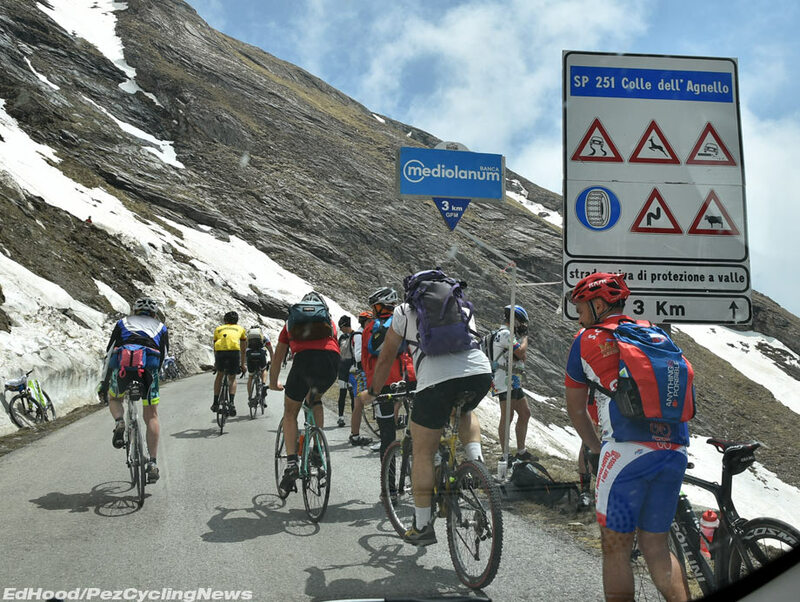 Pontechianali and the road surface is horrible, we're about one third of the way up - "gruppetto !" will long since have been called. Jelle Vanendert looks out over the valley, his supporters well 'dug in' for the day of race watching ahead of them. It eases now and drops for a spell, past alpine meadows. We're over 2,000 metres and still they stream upwards though still, thin, chilly air. 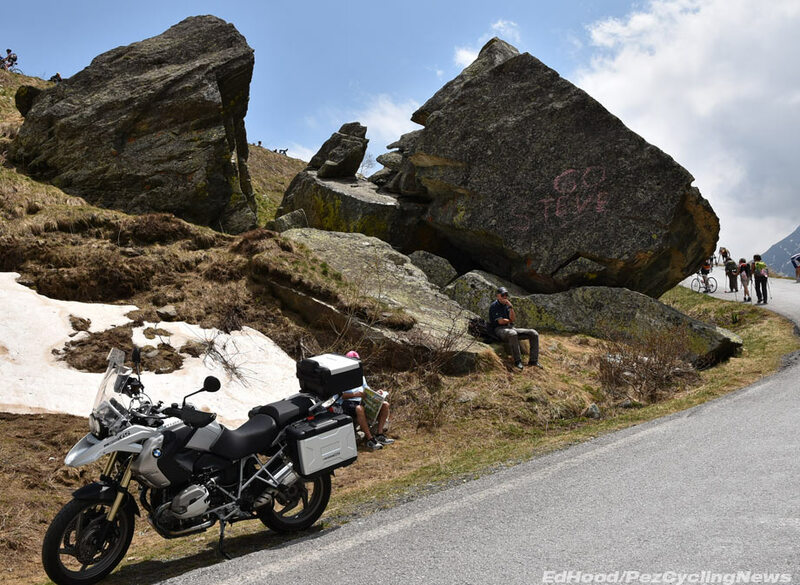 Giant boulders lay beside the road, dumped there in some great upheaval in pre-history. 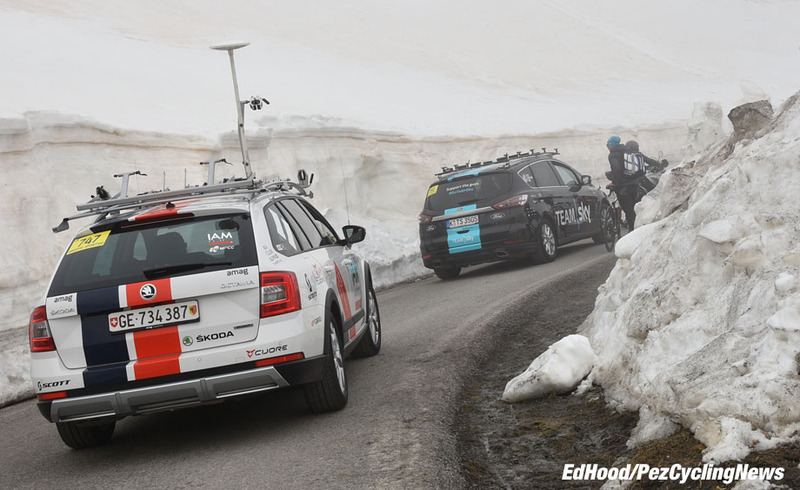 We're above the snow line now, Dave has the Twingo in first gear much of the time as he weaves past guys on mountain bikes wearing sneakers. The entrepreneurs have their burger vans up here - respect ! There's two kilometres to go, we best think about parking up, spaces will be at a premium from here on. 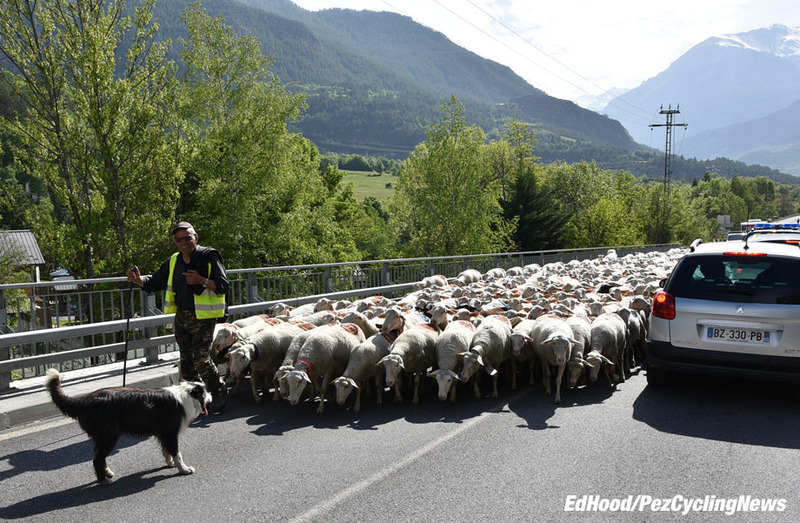 Dave nudges the Twingo off the road - that's us, PEZ embedded on the Agnello. We're not saying it's wild up here but there's a mountain rescue team just over the road. The cloud rolls in, this is going to make taking pictures fun. 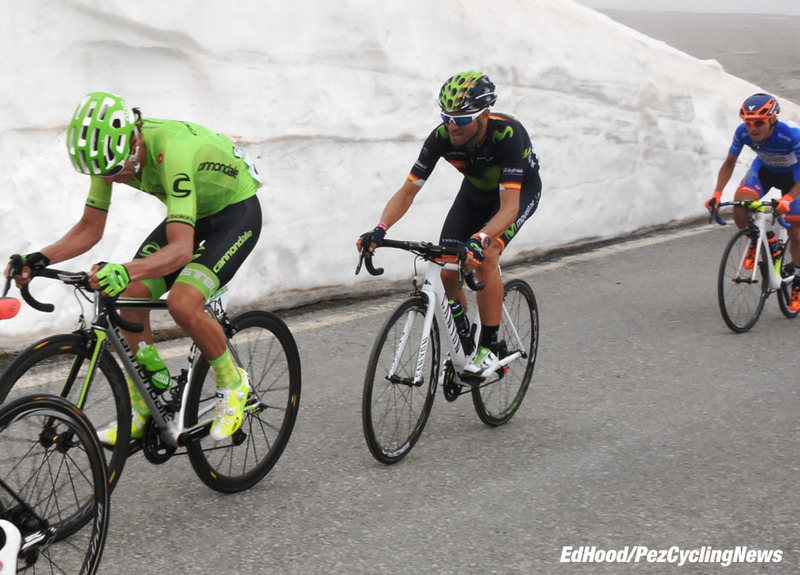 The silence isn't what we're used to on a major Giro climb. The caravan comes and goes - complete with Lamborghini - and then it's still again with visibility getting worse and worse. 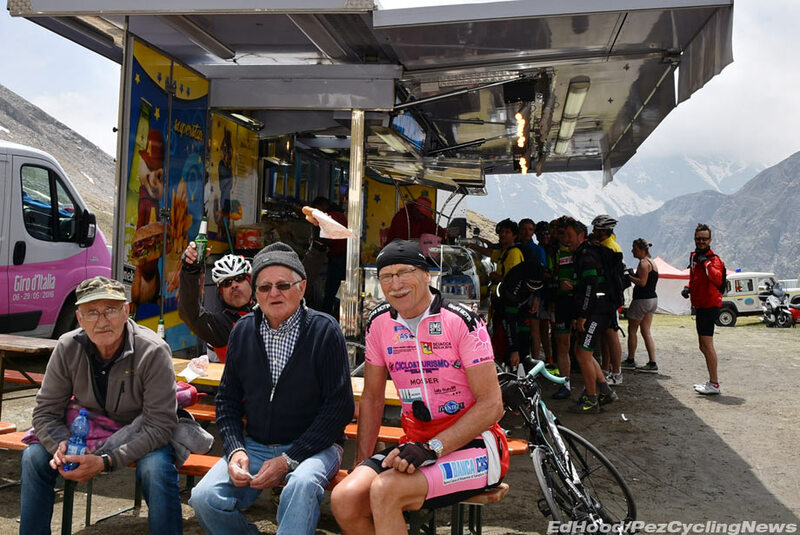 One of the Giant soigneurs appears opposite us, to hand up feeds. 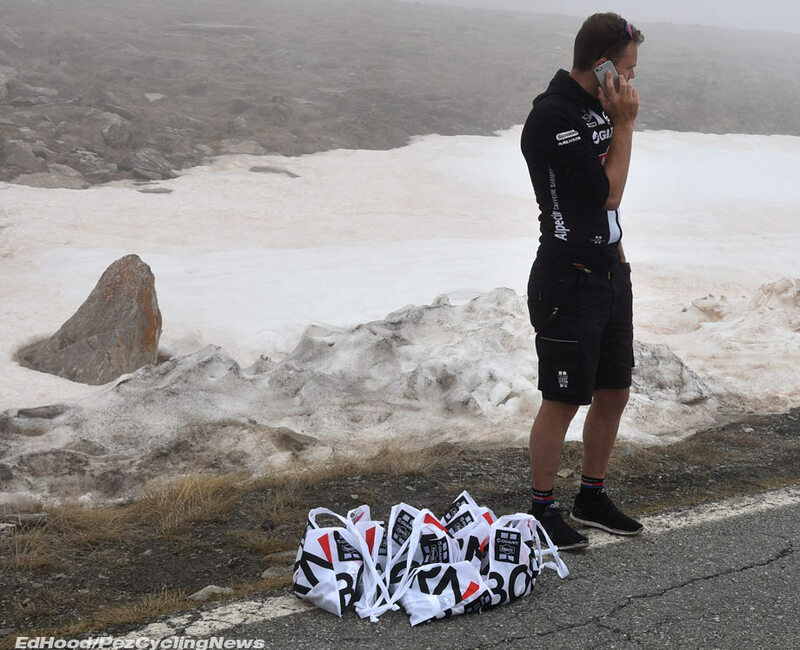 He doesn't know the race situation, just that he has a man in the break - we give him some old Gazzetta pages for up his riders' jerseys on the cold decent and settle down to wait on the race. Ahead of schedule, the police bikes start to stream past. 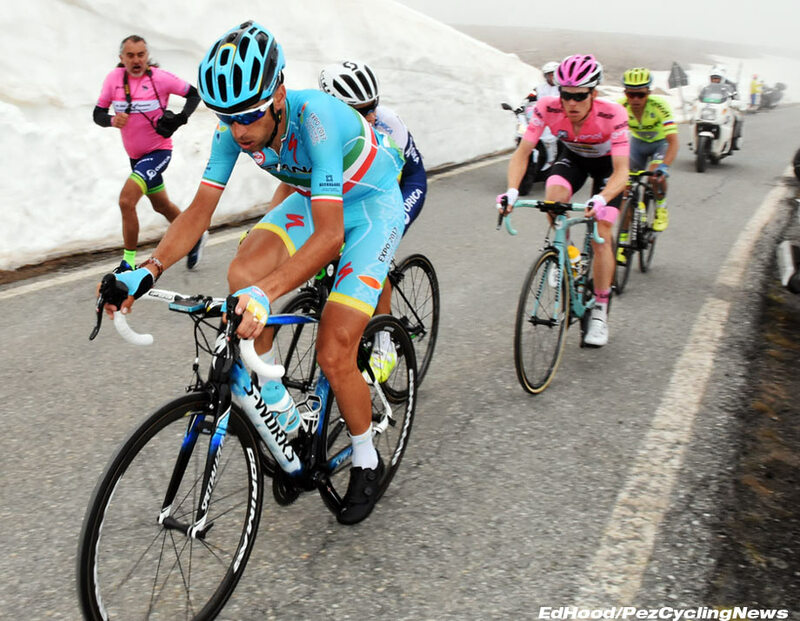 And suddenly, with no warning shouts, there's a rider coming out of the cotton wool, it's Scarponi. 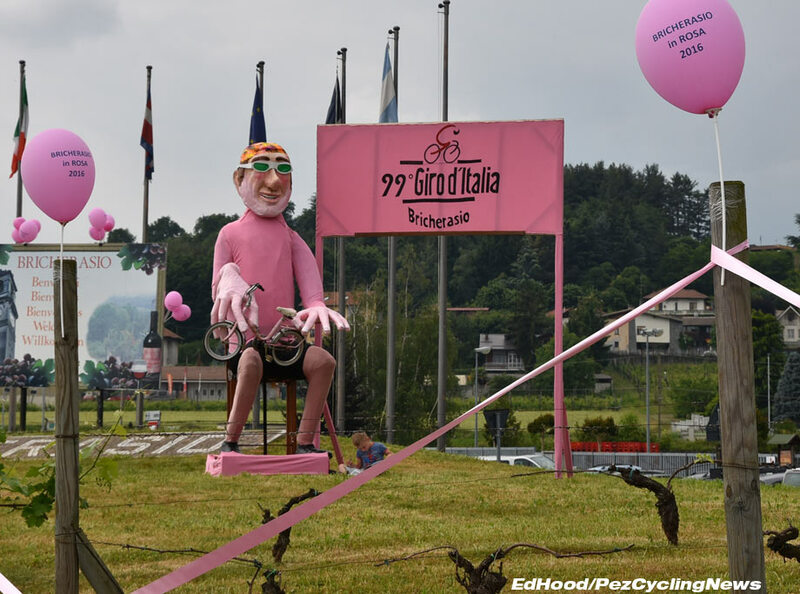 He's obviously up there as a stepping stone for Nibali. 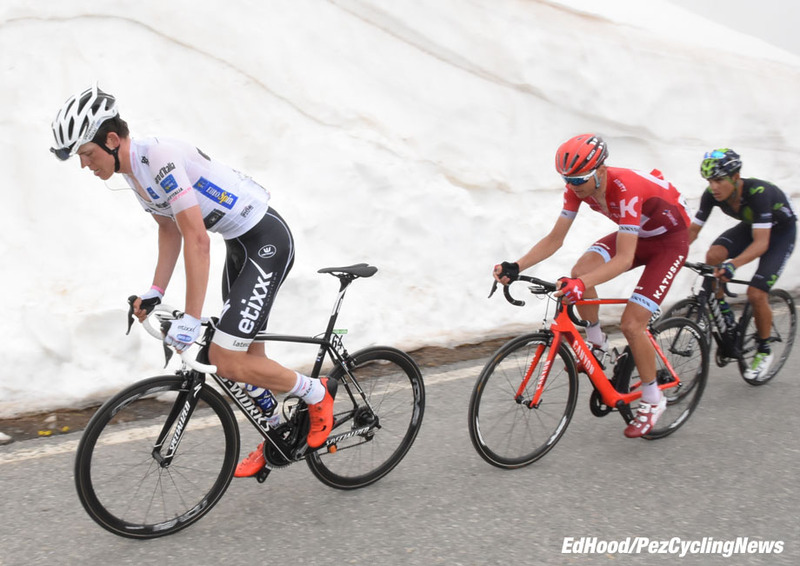 He was in a big break which has dynamited on the climb. 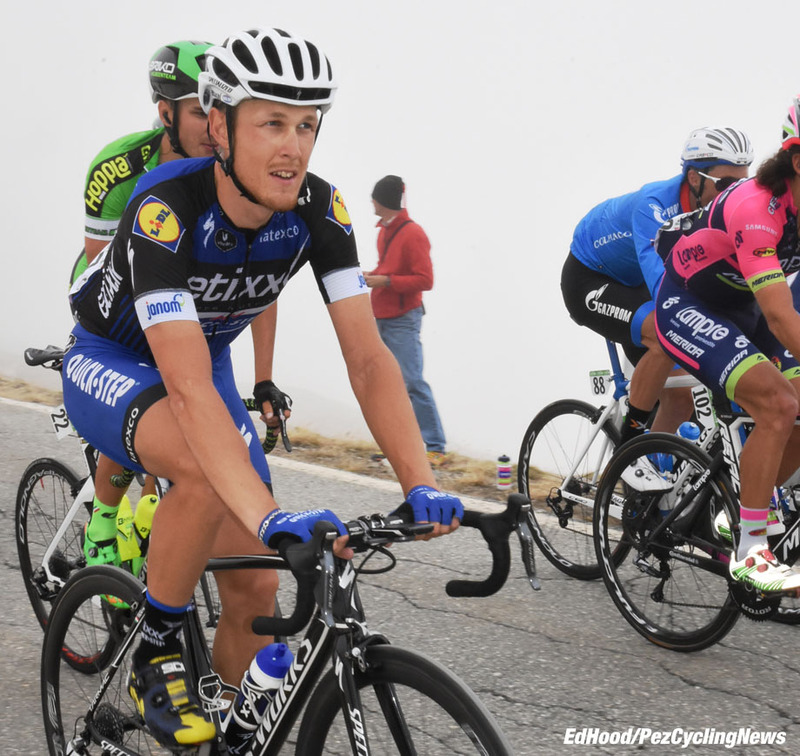 The break stragglers limp past in the cloud - it's 'The Bigs' we're interested in. Nibali, Chaves, Kruijswijk and Majka are all there. 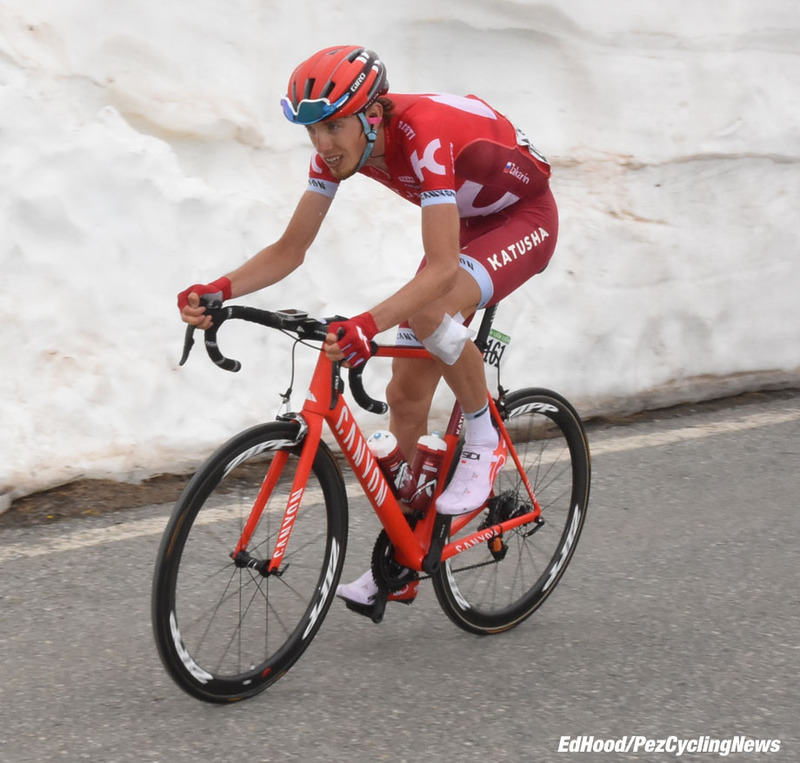 They're both off the pace - little did we know that Zakarin would over cook the chase and end up in hospital with a broken collar bone or for that matter that Kruijswijk would come down hard on a snow bank and loose the maglia rosa. 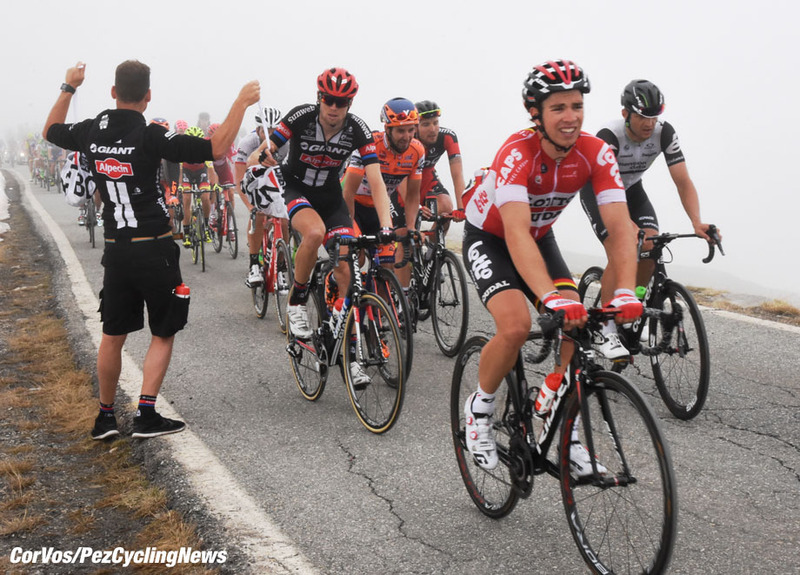 Jungels is off the pace too; that's stage racing - yesterday it was all about QuickStep but today is a different story. 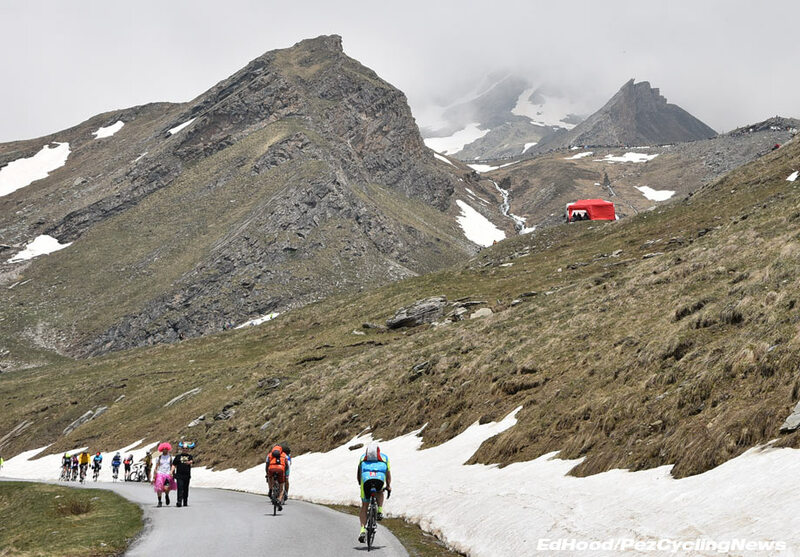 Points leader Nizzolo is impressive today, up the monster ahead of the gruppetto - he's in good shape. Can he get that stage win? We'll find out in Torino on Sunday. 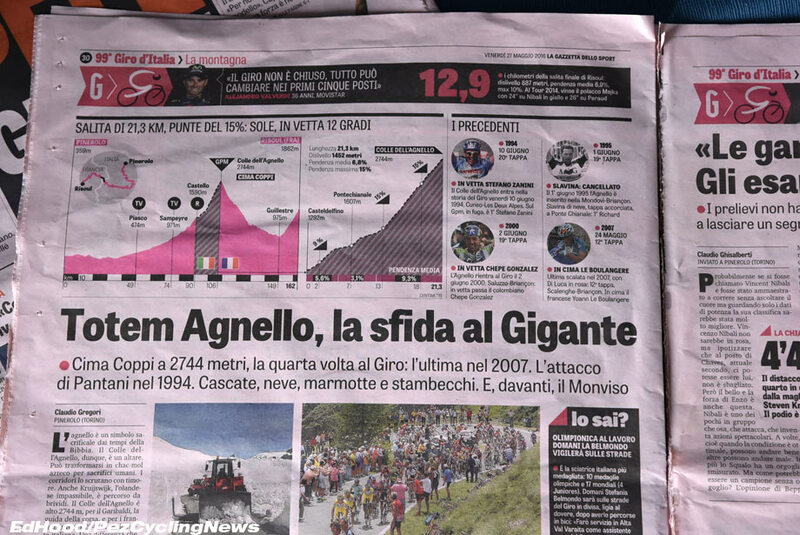 Our Giant chum is working hard, feeding his boys and passing up those Gazzetta pages for the long drop off the col.
And there's yesterday's stage winner, Trentin - just another wasted rider off the back of the gruppetto, today. Stone last? 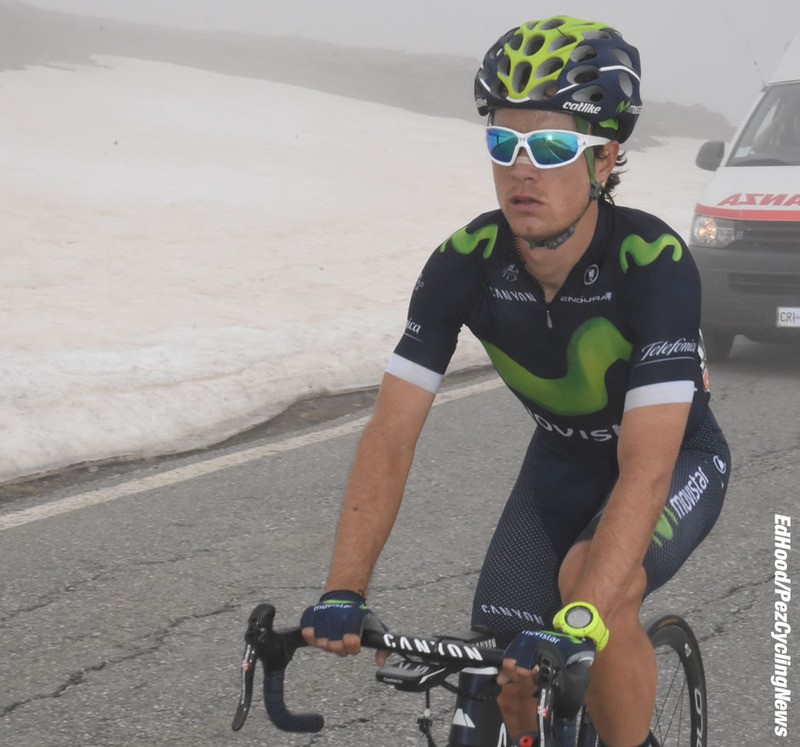 It's hard to believe Carlos Betancur won Paris-Nice in 2014; he's on another 'giornato no' today - that man is so erratic. That's them all through, we hop in behind the convoy. And we get to see what all the fuss was about; serious snow, we're glad we parked where we did, there's just nowhere to park up here. The Cima Coppi and we pass into France, the police are stopping the 'crazies' launching themselves down the mountain so our descent goes without incident. But Kruijswijk's and Zakarin's didn't. • Should Nibali and Chaves have attacked Kruijswijk when he crashed ? • And we're reminded of last year when Aru looked wasted then bounced back to win the hardest stage of the race, late in the day and secure second on the podium. • And wasn't it just yesterday they were talking about medical checks for Vincenzo because his form was so average ? 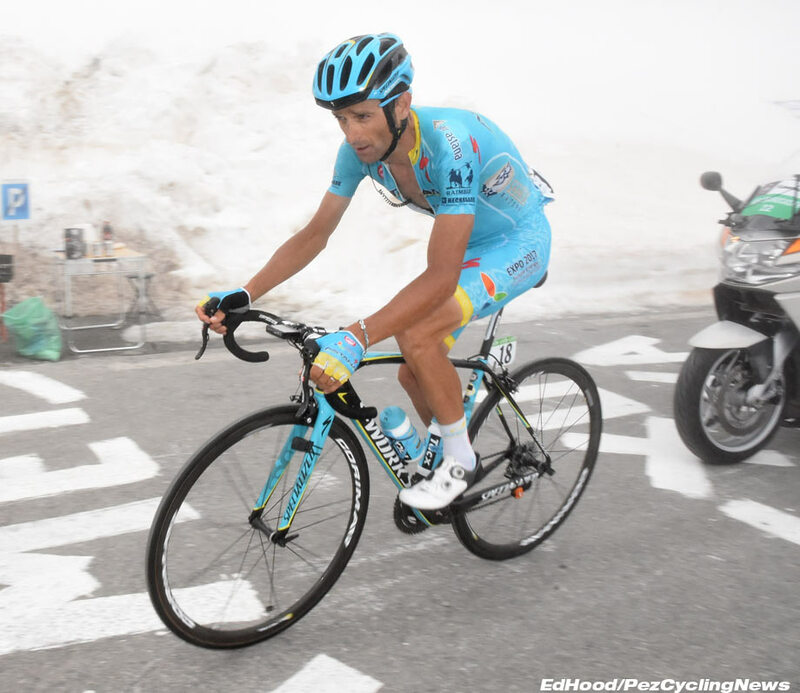 Those Astana boys certainly know how to bounce back. And finally; they say misfortunes come in threes - firstly, we chose the wrong climb, there was the low cloud - and then, en route to the hotel, we got stuck in a flock of sheep. Tomorrow will be better !